Café Reconcile is recruiting new students for its 2019 classes. While Café Reconcile’s Class 1 is already underway, applications to participate in future classes, including Class 2 which begins March 18, are currently being accepted both online and in person. Young adults ages 16-24 years old can apply. To apply online visit www.cafereconcile.org/program/. To submit an application in person visit Café Reconcile at 1631 Oretha Castle Haley Blvd., Monday through Friday from 9 a.m. until 4 p.m. on the third floor. Café Reconcile will contact applicants to participate in an interview. Interviews will take place weekdays between 9:30 a.m. and 1:30 p.m.
To learn more about Café Reconcile’s hospitality training and job placement program contact Erin Gosen at egosen@cafereconcile.org or call 504-934-1640. 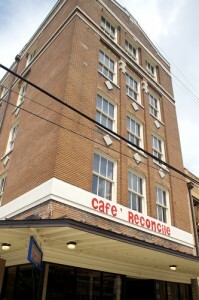 To learn more about Café Reconcile visit www.cafereconcile.org or call 504-568-1157.